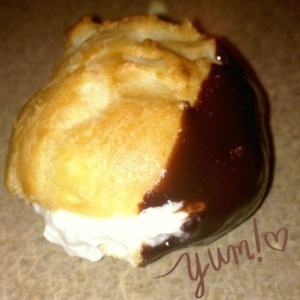 I finally came across a wonderful recipe for cream puffs! I’ve tried a few versions of these, but finally found one I could be proud to post:) It’s a great recipe and they turn out very light and delicious. Instead of making my own cream whip filling, I bought a can of aerosol reddi-whip and filled them just after they cooled . And what’s also great is you can fill them with just about anything and decorate them so they look pretty and elegant. Most “normal” people eat these as a dessert, we eat them for breakfast…WHY NOT??? Set the oven at 400 degrees. Grease a cookie sheet and dampen it with water. 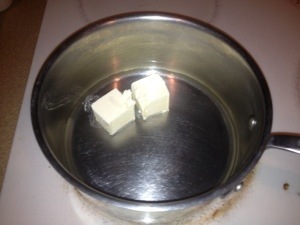 Cut up the butter and heat it in a saucepan with water. 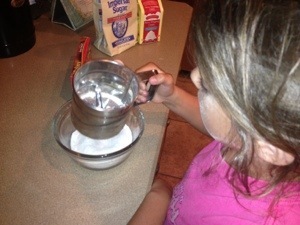 Sift the flour and sugar into a bowl. When the water boils, remove it from the heat and add the flour and sugar. 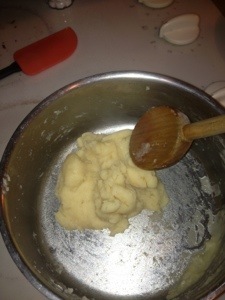 Beat the mixture hard with a wooden spoon until it is smooth and comes away from the sides of the saucepan. 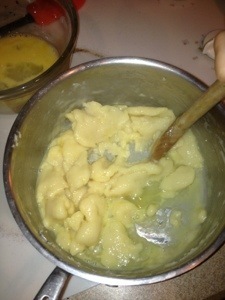 Beat the eggs, then beat them into the mixture, a little at a time, until you have a thick, smooth, glossy paste. 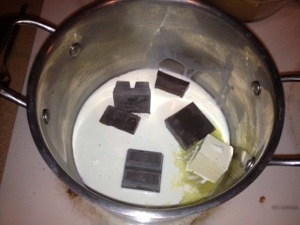 Put teaspoons of the mixture onto the cookie sheet. Keep the puffs small or they will not cook all the way through. 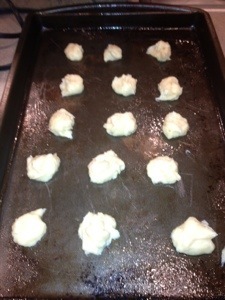 I used a small melon ball scooper and it worked great with the sticky dough. Keep the drops the size of a gum ball or as big around as a quarter. Bake for 20 to 25 minutes until puffy and golden brown. Put the cream puffs on a wire rack to cool. Pierce them with a toothpick or fork to let out any steam to keep them from getting soft. Break the chocolate into a saucepan. Add the butter and cream. Stir over low heat until the chocolate has melted. Whip the cream for the filling in a bowl until thick. Slice open each puff and fill with cream. Arrange the puffs on a serving plate. 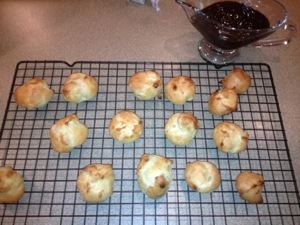 Pour over the chocolate sauce, making sure each cream puff is lightly coated. 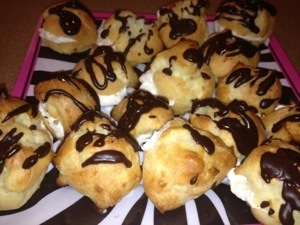 Pour any extra chocolate sauce into a small pitcher and serve it with the cream puffs. My recommendation is to eat them as soon as you can – they taste best when they’re fresh!